That moment when you step on the gas pedal a split second before the light changes, or when you tap your toes even before the first piano note of Camila Cabello's "Havana" is struck. That's anticipatory timing. New University of California, Berkeley, research shows the neural networks supporting each of these timekeepers are split between two different parts of the brain, depending on the task at hand. "Whether it's sports, music, speech or even allocating attention, our study suggests that timing is not a unified process, but that there are two distinct ways in which we make temporal predictions and these depend on different parts of the brain," said study lead author Assaf Breska, a postdoctoral researcher in neuroscience at UC Berkeley. "Together, these brain systems allow us to not just exist in the moment, but to also actively anticipate the future," said study senior author Richard Ivry, a UC Berkeley neuroscientist. Breska and Ivry studied the anticipatory timing strengths and deficits of people with Parkinson's disease and people with cerebellar degeneration. They connected rhythmic timing to the basal ganglia, and interval timing -- an internal timer based largely on our memory of prior experiences -- to the cerebellum. Both are primal brain regions associated with movement and cognition. "Our study identifies not only the anticipatory contexts in which these neurological patients are impaired, but also the contexts in which they have no difficulty, suggesting we could modify their environments to make it easier for them to interact with the world in face of their symptoms," Breska said. To arrive at their conclusion, Breska and Ivry compared how well Parkinson's and cerebellar degeneration patients used timing or "temporal" cues to focus their attention. In another, the colored squares followed a more complex pattern, with differing intervals between the red and green squares. This sequence was easier for the Parkinson's patients to follow, and succeed at. "We show that patients with cerebellar degeneration are impaired in using non-rhythmic temporal cues while patients with basal ganglia degeneration associated with Parkinson's disease are impaired in using rhythmic cues," Ivry said. "Our results suggest at least two different ways in which the brain has evolved to anticipate the future," said Breska. "A rhythm-based system is sensitive to periodic events in the world such as is inherent in speech and music," he added. "And an interval system provides a more general anticipatory ability, sensitive to temporal regularities even in the absence of a rhythmic signal." Materials provided by University of California - Berkeley. Original written by Yasmin Anwar. Note: Content may be edited for style and length. Engaging in musical activities such as singing and playing instruments in one-on-one therapy can improve autistic children's social communication skills, improve their family's quality of life, as well as increase brain connectivity in key networks, according to researchers at Université de Montréal and McGill University. The link between autism spectrum disorder (ASD) and music dates back to the first description of autism, more than 70 years ago, when almost half of those with the disorder were said to possess "perfect pitch." Since then, there have been many anecdotes about the profound impact music can have on individuals with ASD, yet little strong evidence of its therapeutic benefits. To get a clearer picture, researchers from UdeM's International Laboratory for Brain, Music and Sound (BRAMS) and McGill's School of Communication Sciences and Disorders (SCSD) enlisted 51 children with ASD, ages 6 to 12, to participate in a clinical trial involving three months of a music-based intervention. First, the parents completed questionnaires about their child's social communication skills and their family's quality of life, as well as their child's symptom severity. The children underwent MRI scans to establish a baseline of brain activity. Following the sessions, parents of children in the music group reported significant improvements in their children's communication skills and family quality life, beyond those reported for the control group. Parents of children in both groups did not report reductions in autism severity. "These findings are exciting and hold much promise for autism intervention," said Megha Sharda, a postdoctoral fellow at Université de Montréal and lead author of the new research, published in Translational Psychiatry. Data collected from the MRI scans suggest that improved communications skills in children who underwent the music intervention could be a result of increased connectivity between auditory and motor regions of the brain, and decreased connectivity between auditory and visual regions, which are commonly observed to be over-connected in people with autism. "The universal appeal of music makes it globally applicable and can be implemented with relatively few resources on a large scale in multiple settings such as home and school," said Aparna Nadig, an associate professor at McGill's SCSD and co-senior author of the study with Krista Hyde, an associate professor of psychology at UdeM. "Remarkably, our results were observed after only eight to 12 weekly sessions," said Hyde. "We'll need to replicate these results with multiple therapists with different degrees of training to evaluate whether the effects persist in larger, real-world settings," she said. "Importantly, our study, as well as a recent large-scale clinical trial on music intervention, did not find changes with respect to autism symptoms themselves," Sharda added. "This may be because we do not have a tool sensitive enough to directly measure changes in social interaction behaviors." The team is currently developing tools to assess if the improvements in communications skills can also be observed through direct observation of the interaction between child and therapist. Materials provided by University of Montreal. Note: Content may be edited for style and length. Jakarta: Almost a week after a quake-tsunami wreaked devastation in central Indonesia, scientists are zeroing in on what they believe caused the highly unusual natural disaster. The city was not regarded as being at high-risk of a tsunami and was left grossly unprepared for the catastrophe, which has so far claimed more than 1,400 lives with hundreds more injured and missing. Now experts are piecing together the unlikely chain of events which laid waste to Palu. The quake was a sideways -- rather than vertical -- movement of tectonic plates, seen as unlikely to generate a tsunami. "It's very unlikely the earthquake alone could generate a tsunami of that size", tsunami experts have said. But after sifting through mounds of data, scientists believe that the powerful tremor occurred over the vast length of a fault line, triggering underwater landslides that caused the tidal waves. "This is an earthquake that is not the standard mechanism to generate a tsunami," Costas Synolakis, director of the University of Southern California's Tsunami Research Center, told AFP. When the monster waves did roll in, their force was intensified as they rushed down a narrow bay into Palu. In recent years Sumatra has been the main focus of authorities' concern when it comes to tsunamis as Aceh, on the island's northern tip, was devastated by a deadly quake-triggered tsunami in 2004. Officials fear another major quake and tsunami are inevitable at some point on the highly volatile fault line off the island's west coast, meaning there was greater vigilance towards the threat than in Sulawesi. Apart from a handful of tsunami experts, few seemed worried that the fault line that cut through Palu would produce a tsunami, particularly as it is what is known as a "strike-slip" fault, where tectonic plates move sideways. In the Aceh tsunami and the majority of others, destructive waves were generated by a violent upward thrust of the Earth's crust, not a sideways movement. 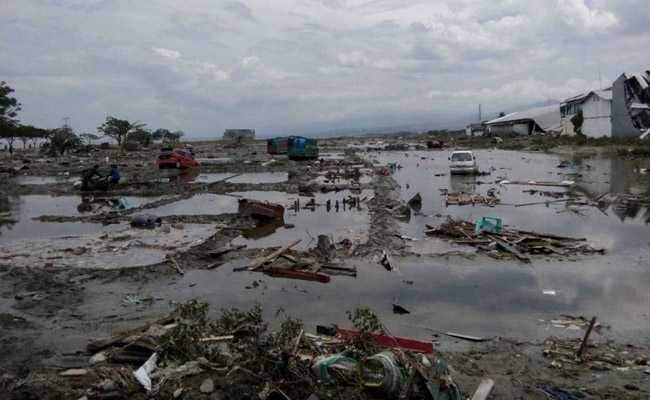 But such was the force of the quake off Sulawesi and the aftershocks that followed, one or more underwater landslides are believed to have occurred that displaced huge quantities of water and sent waves barrelling into the coast. "There is reasonable confidence that this tsunami was triggered at least partially by a landslide," Adam Switzer, a tsunami expert from Nanyang Technological University's Earth Observatory of Singapore, told AFP. "It's very unlikely the earthquake alone could generate a tsunami of that size." Even before the tsunami hit, the quake and the aftershocks that followed caused widespread devastation along the Sulawesi coast, with many buildings left in ruins and huge cracks ripped in roads. But with officials not expecting such a catastrophic event in the area, Palu seemed ill-prepared. A tsunami alert was issued at the national level when the quake hit but was lifted soon afterwards and it is not clear if there was an effective mechanism to relay the warning to people on the ground in Sulawesi. And the city's tide-monitoring station, which could have detected the destructive waves, was broken on the day, authorities have admitted. But while many in Indonesia were surprised that the disaster hit Palu, scientists say there are other examples of such quakes. Of about 35 tsunamis documented since 1992, four are believed to have been caused by quake-triggered undersea landslides, but none were in Indonesia, according to Synolakis. Despite the criticism that authorities were unprepared, seismologists have been more forgiving -- they say the chain of events was so complicated it would have been hard for even advanced warning systems to detect the tsunami. "This is something the automated systems could not really anticipate," Synolakis said. Switzer said and his colleagues were working flat out to figure out exactly what happened, and it would likely be a long process. "We really need to make sure that we understand this event, because we have to learn from this," he said. By analyzing methane in the skies of Jupiter and Saturn's moon Titan, scientists are now pinpointing what effects this global warming gas is having on Earth, a new study finds. Greenhouse gases warm the planet by trapping heat from the sun. The greenhouse gas that most often makes news is the carbon dioxide generated in great amounts by the burning of fossil fuels. However, methane is an even more potent greenhouse gas, pound for pound capable of warming the planet more than 25 times more than carbon dioxide over the span of a century, according to the Intergovernmental Panel on Climate Change (IPCC). Recent climate models are designed to account for shortwave absorption of methane. However, their accuracy is limited by uncertainties in how well methane absorbs shortwave radiation. Whereas the carbon dioxide molecule has a relatively simple linear shape, methane has a more complex tetrahedral shape, and the way it responds to light is also complicated — too much so to pin down in the lab. Instead, scientists examine the atmospheres of Jupiter and Saturn's largest moon Titan, which both have "at least a thousand times greater concentration of methane than Earth's atmosphere," study co-author Dan Feldman, a climate scientist at Lawrence Berkeley National Laboratory in Berkeley, California, told Space.com. As such, these celestial bodies can serve as "natural laboratories" for investigating sunlight's effects on methane, he explained. The scientists analyzed data of Titan from the European Space Agency's Huygens probe, which landed on the big moon in January 2005, and of Jupiter from NASA's Hubble Space Telescope. This helped pinpoint how methane absorbs various short wavelengths of sunlight, data the researchers plugged into climate models of Earth. The scientists found the global warming effects of methane are likely not uniform on Earth, but vary over the planet's surface. For instance, since deserts near the equator have bright, exposed surfaces that reflect light upward, shortwave absorption is 10 times stronger over regions such as the Sahara desert and the Arabian Peninsula than elsewhere on Earth, Feldman said. In addition, the presence of clouds can increase methane-shortwave absorption by nearly threefold. The researchers noted these effects west of southern Africa and the Americas, and with the cloud systems in the Intertropical Convergence Zone near the equator. "We can really nail down the methane greenhouse effect on Earth based on observations of Jupiter and Titan," Feldman said. These findings support previous climate models regarding methane's effects on global warming. The researchers said their work could help advance climate-change mitigation strategies by clarifying the risks different regions across the world face. The scientists detailed their findings online Wednesday (Sept. 26) in the journal Science Advances. “The ring is a huge geological feature and the primary source of major earthquakes and volcanoes in the world,” van der Pluijm said. The Ring of Fire was rocked by 19 earthquakes in 24 hours. Two of the seismic disturbances registered more than 5 on the Richter scale. Experts predict more than 100 quakes measuring between 6 to 6.9 range for 2018; the figure currently stands at 75. Two earthquakes struck off the coast of the Greek island of Crete, the United States Geological Survey (USGS) said. The quakes, measuring 4.5 and 4.4 in magnitude, occurred four minutes apart. The first 53 kilometers south-west of Tympakion and the other 55 kilometers from Tympakion. Major tremors over the last day included a 5.8-magnitude quake which struck 30 miles east-southeast of the Solomon Islands and another 5.5-magnitude hitting 31 miles east-northeast of Fiji’s Ndoi Island, according to the USGS. The dreaded Ring of Fire stretches a total of 25,000 miles from New Zealand to the tip of South America in a horseshoe shape. Late last month, 25 quakes were recorded in a 24-hour period, including one measuring 7.1 off the coast of New Caledonia in the South Pacific. At one point, some 69 earthquakes reportedly struck the ring over a 48-hour period. WASHINGTON: Scientists have peered into the thick layers of Spanish artist Pablo Picasso's famous Blue Period painting, unveiling a page from a 1902 French newspaper and traces of another artwork. Researchers from National Gallery of Art in the US conducted hyperspectral infrared imaging of Picasso's Mother and Child by the Sea - a painting in the collection of the Pola Museum of Art in Japan. The analysis revealed portions of printed text in French similar to newsprint. Using the readable text, Keiko Imai, chief curator, Pola Museum of Art, was able to identify the source of the text as an issue of the French daily newspaper Le Journal published on January 18, 1902. While the reason for the presence of newsprint in the paint layers is a mystery, the discovery is significant for Picasso scholars due to the proximity of the date to the artist's move from Paris to Barcelona. The study also provided more information about a prior paint composition seen in the X-radiograph. The infrared images also show another earlier signature by the artist in the opposite orientation. "I was surprised and fascinated by this finding in a painting I have always admired at our museum. We were able to officially confirm that Mother and Child by the Seawas painted after the date of the newspaper article used on the canvas," said Imai. "We routinely focus our cameras on a sheet of paper with printed text prior to placing the painting on the easel," said John Delaney, senior imaging scientist, National Gallery of Art. "To verify we were in good focus, we pointed the camera first at the face of the mother and to my surprise immediately saw newspaper text in her face!" said Delaney. "The presence of a paper interleaf begins to make sense of the fine wrinkling in the surface texture and the gentle undulations observed in several areas over the surface," said Sandra Webster-Cook, senior paintings conservator, Art Gallery of Ontario (AGO) in Canada. "It suggests that the paper does not perfectly conform to the underlying paint surface," said Webster-Cook. "What is exciting about this finding is that the sheet from Le Journal that Keiko Imai has identified offers Picasso scholars a firm date before which the seated woman in the composition underneath was painted," she said. "The January 18, 1902 date of the paper interleaf is also of interest, as it is known Picasso returned to Barcelona from Paris sometime in early January 1902," she said. Picasso is commonly known to have reused canvases and often integrated elements of previous compositions into his subsequent works. Indications of earlier compositions are often visible on the painting's surface, and can be linked to distinctive crackle patterns, different paint colours visible through cracks and abrasion or at the edges of works, and the texture of dried impasto formed from previous paint layers that do not correspond to the painting's final composition.